2013 marked the 10 year-commemoration of Fregenet Woubshetís untimely passing. 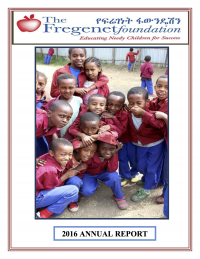 In honor and remembrance of Fregenet, all of us at the foundation work tirelessly to help children of poverty to obtain the education to propel them toward better and brighter futures. And with this in our minds and hearts, we press forward into the New Year with absolute determination to make it another successful year. Without a doubt, 2012 was the Foundationís most successful year yet, a year in which we expanded the schoolís enrollment and enhanced the quality of the educational experience students receive. 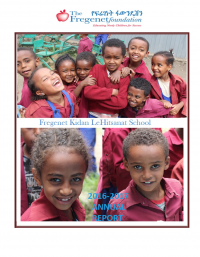 The Fregenet Foundation began 2011 by asking you, our supporters, to ìdig deeper and think harderî about meeting the needs of our young students in Addis Abeba. As the New Year begins, we can thank you heartily for making 2011 one of the most rewarding years in our history. Imagine it is Fall 2004. The Fregenet Foundation has gone from dream to reality and our first 31 children walk through the school doors. For them and their families it must have seemed like a dream as well. But doesnít it feel like just yesterday? Yet here we are again to report to you the highlights of our accomplishments of 2010. The Fregenet Foundation has been working tirelessly to achieve its objective of giving a high quality education to children who might otherwise, because of their economic circumstances, not have even attended school at all. Our dream of building and supporting schools that not only serve as centers of education, but as resources for the broader community is under way. 2008 has been a great year for the Foundation, the School and our students. We have accomplished many of the objectives that we outlined for the year despite our limited resources. Slowly and surely, we are marching forward! 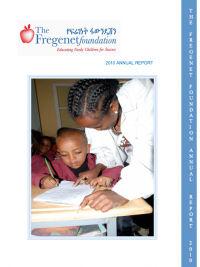 Itís been a busy and eventful year for the Fregenet Foundation. It has only been four years since our establishment and we are proud to have a successful and fully operational school as a manifestation of our efforts. And though we have met our fair share of obstacles, this year has been characterized by positive change, upward progress and promise for the future of our mission.